In June 2002 I was in the small town of Campbell River on a project for work and drove past a motorcycle shop. In the window of the shop I was surprised to see a bike that looked like the 1974 CR125M that I raced back when I was 16, except it was red. I had many fond memories of my old bike and so I bought the bike in the window thinking that I would fix it up to ride. 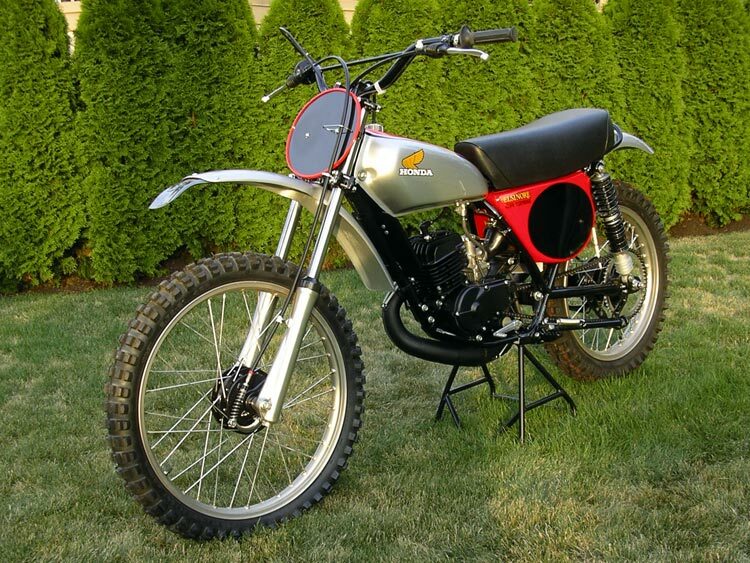 It was a 1975 CR125M1 serial number 2009224. I got it home, disassembled it, then stripped and powder coated all the black frame pieces. It looked so nice that I decided that rather building a riding bike, I would restore it to the condition that it was when it left the factory thirty-some years ago. The bike was in pretty nice shape to start with. The seat you see on the bike is the perfect original. I bought lots of NOS parts on ebay and from this Honda Elsinore website as well as CMS from Holland and Western Hills Honda. The tank, fenders and sidecovers were repaired and repainted by a scary looking (but very talented) fellow who specialized in Harley choppers. The front forks were a little pitted and so I had them hard chromed by a hydraulics company who rechromes hydraulic cylinders. The engine was completely rebuilt with all new bearings and seals, new rod kit, rebore and new first over piston and rings. The rebuilt engine has not been started. All the shiny chrome pieces that weren't NOS were rechromed. All nuts, bolts, spokes and other hardware that weren't NOS were replated by a zinc plating company. The rims were de-anodized, touched up and then re-anodized for a perfect finish. The only aftermarket pieces on the bike are the tires, bronze swingarm bushings and air filter. I couldn't locate NOS Bridgestone tires so tires with a similar tread pattern were used. The rarest piece I found is the factory stand. It was a real pleasure carefully installing each piece onto the bike as it slowly got closer to completion. The restoration was finished in June 2006 with the mounting of the pipe. It was a lot more work, time and money than I ever imagined at the outset but I'm very pleased with the result. I picked up two more 75 CR125M1's that my son and I use for riding.